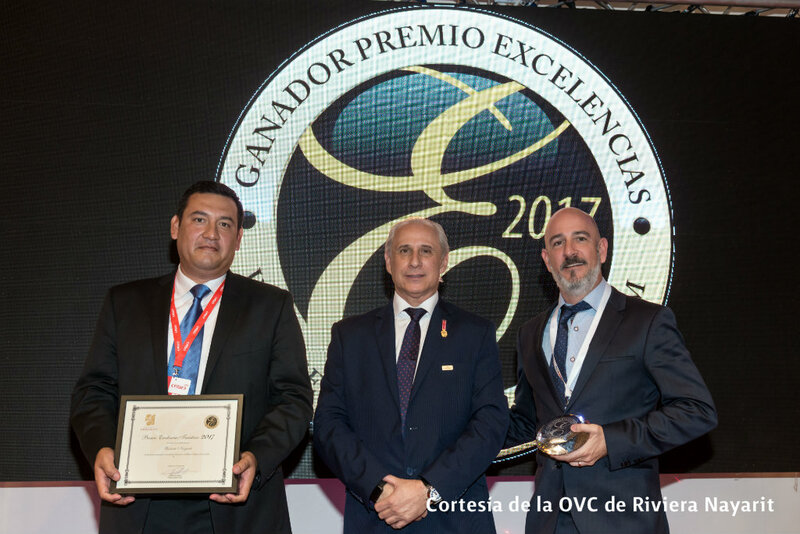 Eulalio Coronado Mendoza, State Secretary of Tourism, and Marc Murphy, director of the Riviera Nayarit Convention and Visitors Bureau (CVB) received the award from the hands of José Carlos de Santiago, President of the Evaluating Committee of Grupo Excelencias. 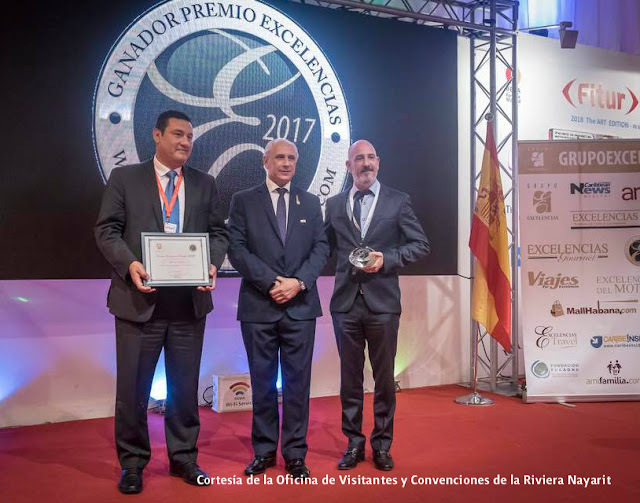 The Riviera Nayarit received the Excelencias Turísticas 2017 award during the 2018 International Tourism Fair (FITUR). The state of Nayarit received the Excelencias Turísticas 2017 award for Successful Use of Gastronomy as a Cornerstone of the Riviera Nayarit’s Tourism Promotion during the 18th edition of the 2018 International Tourism Fair (FITUR) in Madrid, Spain. Since the creation of the brand 10 years ago, gastronomy has become a key asset for the tourism promotion of the Riviera Nayarit, so much so that it shares space with strategies activated on an international scale. This year, the Premios Excelencias honored 21 projects and personalities in different categories, all of them with an outstanding trajectory within the tourism, cultural and culinary sectors. The state of Nayarit proved their commitment with the tourism industry within this group of competing companies. 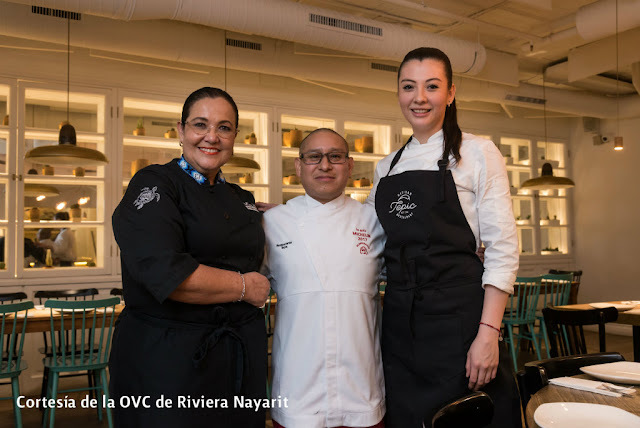 Within this context, the presence of chef Betty Vázquez, Culinary Ambassador for the Riviera Nayarit, was key. She has participated in the most important conventions and culinary encounters on a global scale, and has served as a judge on Master Chef Mexico since its inception. The chef was a special guest of the Ministry of Tourism during the inauguration of the Mexico Pavilion on Wednesday, January 17, where she presented a tasting of the flavors of Nayarit together with Mexican restaurant Tepic, located in Madrid. Together they transformed the pavilion into a mandatory stop for attendees to enjoy the delicious and fresh ceviches of Nayarit. 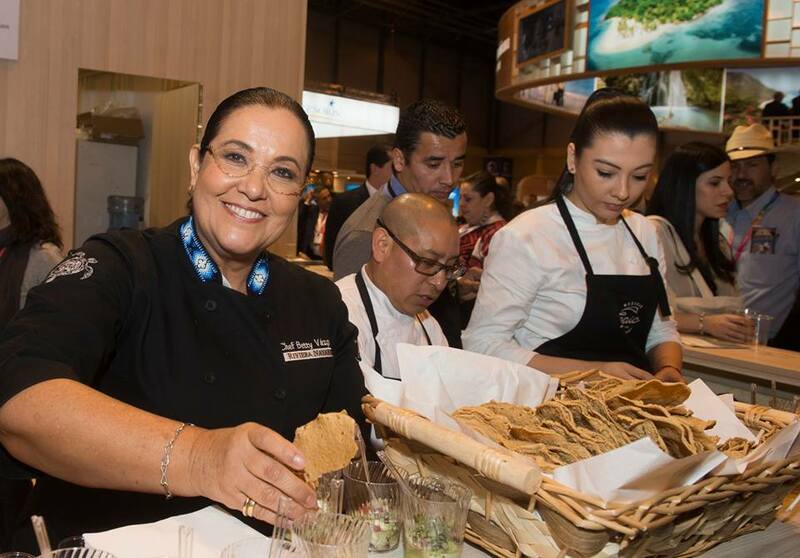 Chef Betty Vázquez, Culinary Ambassador for the Riviera Nayarit. “All of Nayarit is fertile ground, and the ample variety of foodstuff you can find in its beaches, valleys and mountains is enough to surprise every visitor,” commented chef Betty. The promotional work of the Riviera Nayarit Convention and Visitors Bureau and the Bahía de Banderas Hotel and Motel Association continued that same day with a press cocktail with 29 journalists from Spanish media including Vogue, Expansión, Cosmopolitan, El Español, Tentaciones de El País, Glamour, Guía del Ocio, In Style and Gastronomistas, just to mention a few. On January 19th chef Betty presented a Mexican menu at Tepic restaurant, celebrating its 10th anniversary together with its chef de cuisine, Ángel Rodríguez. Of note is the fact the Tepic restaurant has been working with the Riviera Nayarit since 2011, when it opened its own pavilion at Madrid’s Fitur and offered attendees a culinary tasting with a cocktail, becoming since then an excellent ally in the promotion of Nayarit’s gastronomy. The Riviera Nayarit Convention and Visitors Bureau (CVB) and the Bahía de Banderas Hotel and Motel Association (AHMBB) continue to work jointly to boost the region, strengthening promotional efforts and helping position Mexico’s Pacific Treasure on the world’s culinary map, together with the full support of the Government of the State of Nayarit via the Tourism Promotion Trust (Fiprotur).